The company is located in Washington State, USA. The product is actually made for them in Denmark. 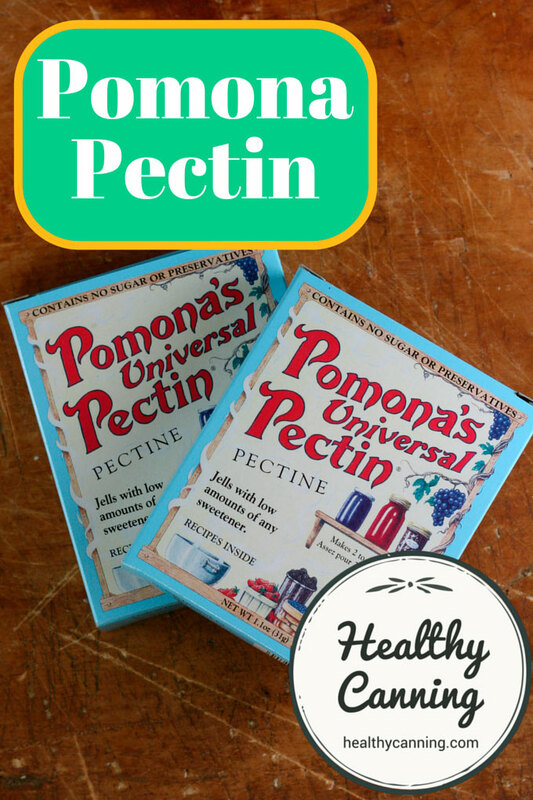 How is Pomona different from other no-sugar-needed pectins? 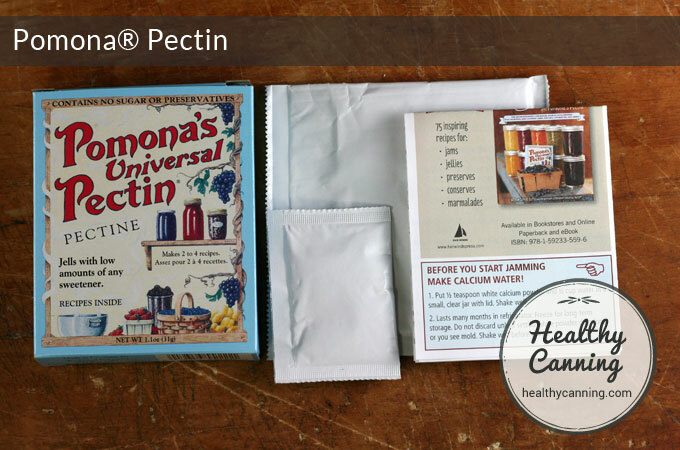 What comes in a box of Pomona Pectin? 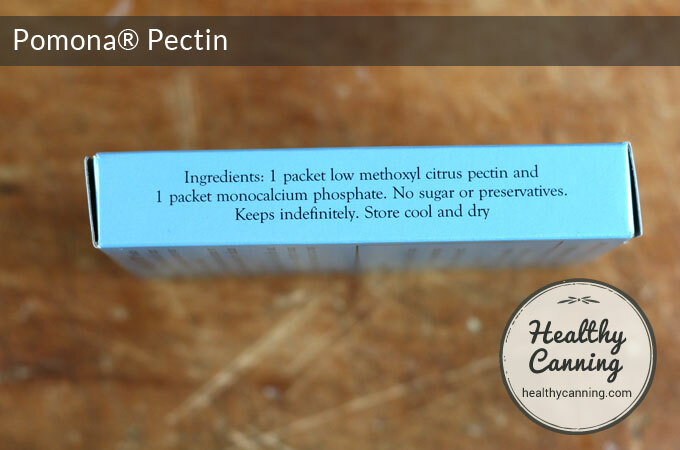 Most other “no-sugar-needed pectins” contain other ingredients in addition to the pectin. For instance, Ball and Bernardin’s “No sugar needed” pectin contain added sugar in the form of dextrose, and have citric acid to them. Pomona instead is 100% pure citrus pectin extracted from the dried peel of lemon, lime, and orange. It’s kosher certified at the factory. It’s also vegan, gluten free, and GMO free, though it’s not certified organic at this time. 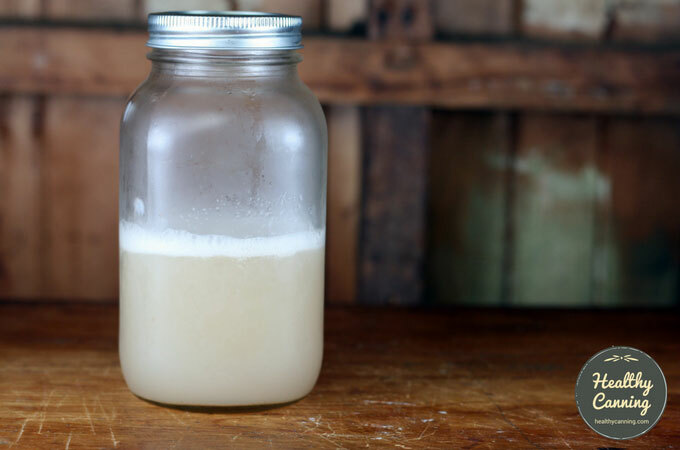 In addition, most other “no-sugar-needed pectins” only provide a very small handful of recipes, and warn you against deviating from the recipe, adjusting the recipe in quantity, or making up your own recipes. In contrast, Pomona provides hundreds and hundreds of recipes, allows you to scale batch sizes up or down, and gives you guidelines (in terms of both success and safety) for going “off-recipe” and making your own recipe. Note as well that Pomona’s pectin can’t dissolve properly in a high-sugar environment. So if you do choose to use sugar with Pomona, which you may, you need to add Pomona to the recipe first before the sugar goes in. 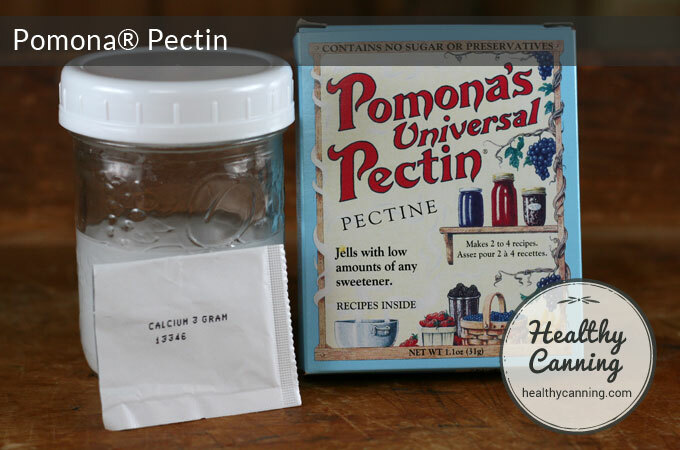 Pomona Pectin is what is known as a “low-methoxyl pectin.” Here’s a brief video overview of low methoxyl pectin from PennState Extension. Note that Dr Martha Zepp (the main speaker) is holding a box of Pomona when she says it is “an acceptable choice” for making (jams) and jelly with less sugar. 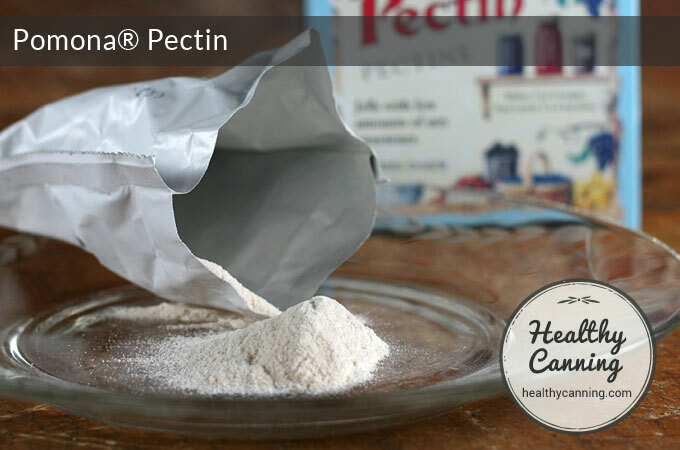 The box contains a large packet of pectin, a small packet of calcium powder, and a small leaflet of directions. A 30 g (1 oz) box will do several batches of jam, making anywhere from 8 to 16 x 1/4 litre (250 ml / 1 cup / 8 oz) jars, depending on the fruit or recipe. For jelly, you’ll get about half that number of jars, because it doesn’t have the volume of the mashed fruit in it. 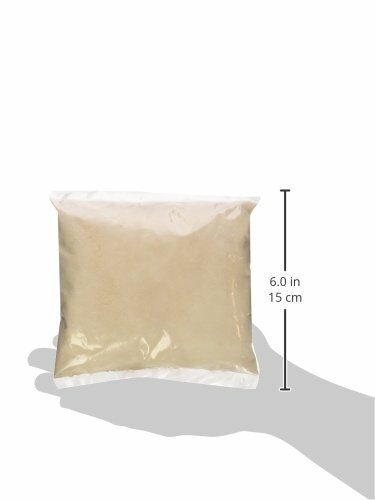 You can also order Pomona pectin in bulk: in 225 g and 450 g (1/2 lb and pound) bags. 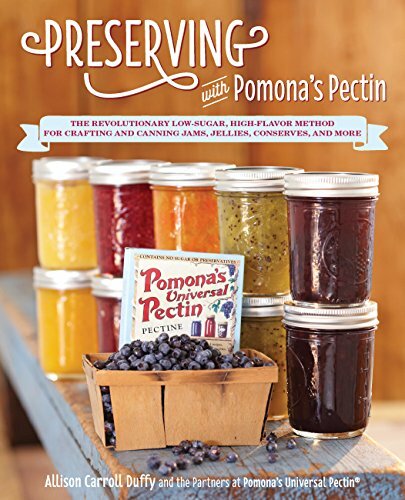 Here is a short video tutorial from one of the makers of Pomona’s pectin. 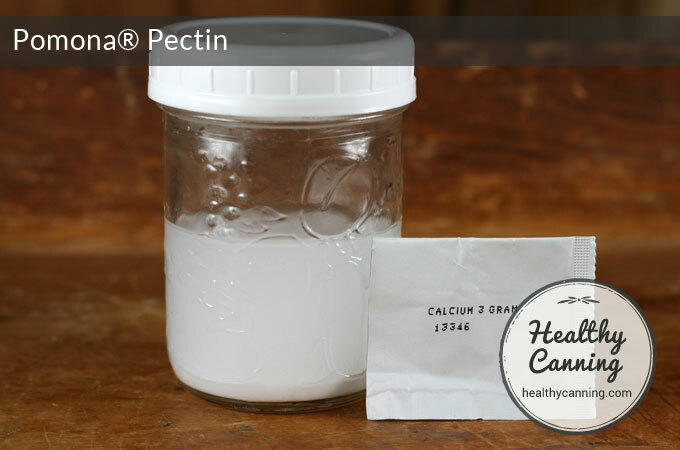 Low methoxyl (LM) pectin such as Pomona needs calcium to activate it. In theory, some fruits might have enough calcium in them to do the trick, but not all fruits, and besides, consumers aren’t going to know the chemical breakdown of every fruit. Consequently, Pomona supplies you with a small 3 g packet of calcium that you mix up with some water and add to the product you are making. It’s technically “monocalcium phosphate” powder, made from calcium and phosphorous. To mix up the calcium water, the directions tell you to use 1/2 teaspoon of the powder from the small calcium packet. When you pour it into a half-teaspoon measure, and level it off with a knife the way Fanny Farmer taught us, it might look like the packet had 3/4 teaspoon in it, but in fact, you are supposed to use the whole 3 g of calcium powder. That’s presumably 1/2 teaspoon in volume when pressed and settled down. The calcium powder has an indefinite shelf life in the package, and a longish storage life mixed up and refrigerated, but discard if you see any mould or colours appearing in the mixture. 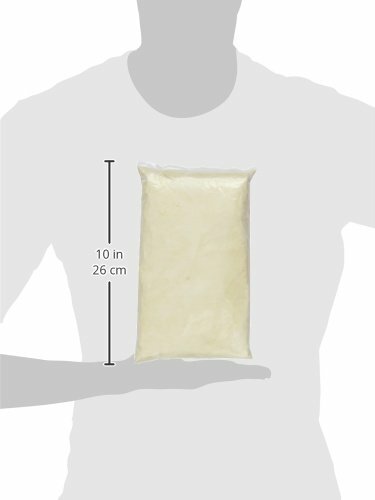 The large packet has around 30 g (or around 12 x 5 ml teaspoons) of pectin powder in it. Pomona says a teaspoon of it is 3 g.
The powder is quite slimy when liquid hits it. Don’t mix Pomona’s directly with fruit, or the Pomona will clump. The Pomona must be pre-mixed into something before being added to the main mixture. 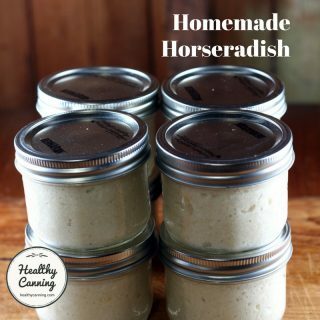 Add it first to either a liquid sweetener that is no more than 1/4 the amount of mashed fruit or juice, or, to an amount of dry sweetener if using that is no more than half the volume of mashed fruit or juice. For liquid sweetener such as stevia see below. 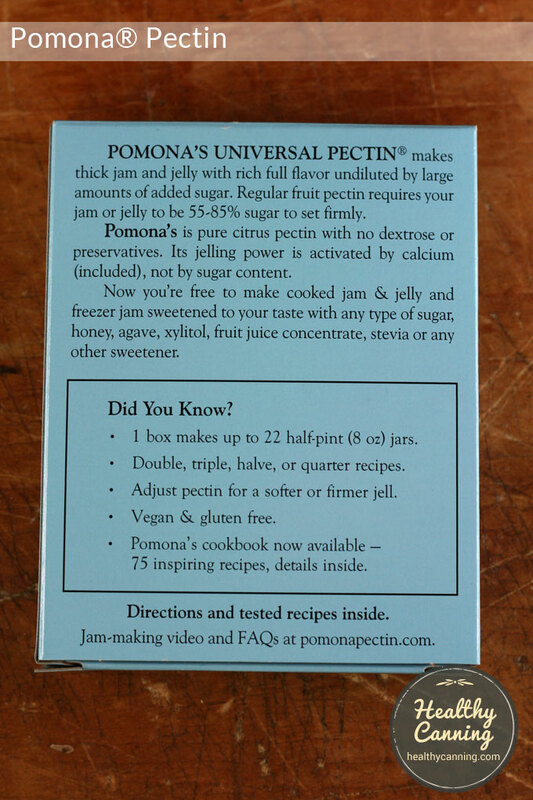 Unlike other pectin, you add Pomona’s pectin at the end of the cooking process, when your jam and jelly have been cooked in the pot. After you add the Pomona’s pectin, do not cook the jam or jelly for more than a minute or two, or you will de-activate the pectin and get poor results. The shelf life of the mixed up calcium powder with water, stored in a sealed container in the fridge, is at least several months usually. 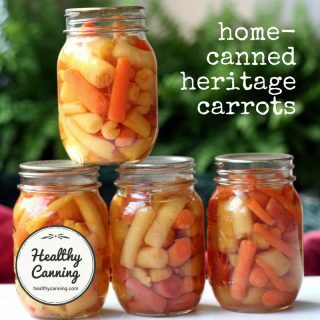 The shelf life of jams, jellies and other products made from Pomona in unopened water-bathed jars on the shelf, is at least a year, subject to the USDA’s advice that for best quality, you should use home canned goods within a year. At the end of that year, don’t throw it out: just make sure it’s at the front of the shelf, to be used up first before other things. 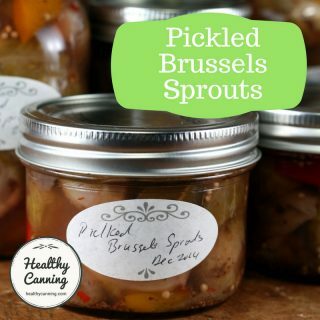 Once you open a jar, store in the fridge, and try to use up within a few weeks. All lower-sugar jams and jellies become susceptible to moulds after opening. b) put in a jar large enough to give you ample shaking room, put the lid on the jar tightly, and wearing oven gloves (against the heat) shake the jar vigorously. Let rest for a few minutes, then shake again. Repeat as often as needed to blend. You can also let sit overnight in jar if desired to dissolve further. Skim any foam off top before using. Both blending suggestions come from the Pomona people. However you blended it, then add it back to the main mixture. And remember, again, after adding the pectin, cook for only 1 or 2 minutes, then get your pot off the heat so you don’t ruin the pectin. You can always adjust the sweetness with your liquid stevia after the pot is off the burner — cooking is immaterial to the liquid stevia! 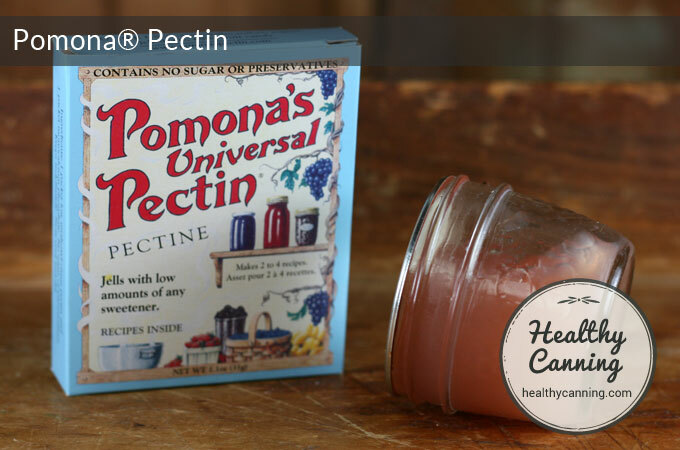 Pomona pectin powder shaken in a jar to blend it. In terms of Weight Watcher’s PointsPlus®, it’s 0 points per teaspoon up to 6 teaspoons, 1 point from 7 to 20 teaspoons. Pomona’s has no citric acid added to it, as some sugar-free pectins do. “Other pectins have acid added to them; Pomona’s does not.”  Sumberg, Mary Lou. Blog post response. 24 July 2014. Accessed March 2015 at https://www.pomonapectin.com/faq/#comment-848 So for safety to prevent botulism and other nasties, it is mandatory that you add the bottled lemon or lime juice in the quantities specified by Pomona recipes. That is for health and safety; not flavour. On the recipe sheet for jam, some fruits have an asterisk. That means that you need to add 4 tablespoons of lemon or lime juice (or 1 teaspoon powdered Citric Acid.) 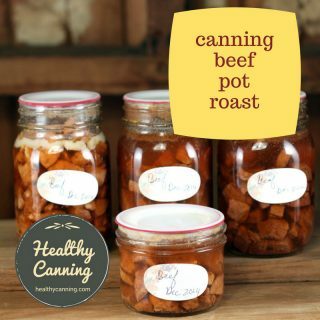 You need to do this to adjust the acidity (lower the pH) for canning safety, and sometimes, to get a gel. (They do note that in the case of pomegranate, it’s just for flavour.) Note: Ascorbic Acid won’t provide the safety of Citric Acid; don’t substitute. Remember, just because you get a gel on the jam, and a seal on the jar, doesn’t mean it’s safe: remember the watermelon jelly botulism outbreak that occurred in Vancouver in 2011. So, use a tested recipe with Pomona’s. While most pectins have strict directions about not varying the batch size or doubling, tripling, etc, the batch of jam or jelly you are making, with Pectin there is no restriction: it is easy to vary the batch size. 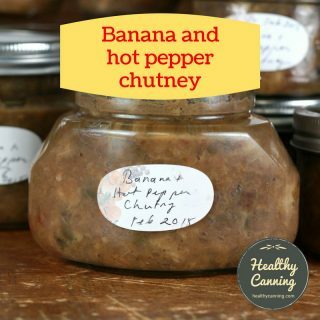 Overall, for anyone looking to home-can low or no sugar (or alternative sweetener) jams, jellies, etc, it’s Pomona who has the greatest number of recipes to support their product. As of summer 2017, there are over 150 recipes on Pomona’s web site, plus an additional 75 in their Pomona book. So if you want a wide variety, you will likely want to consider Pomona. 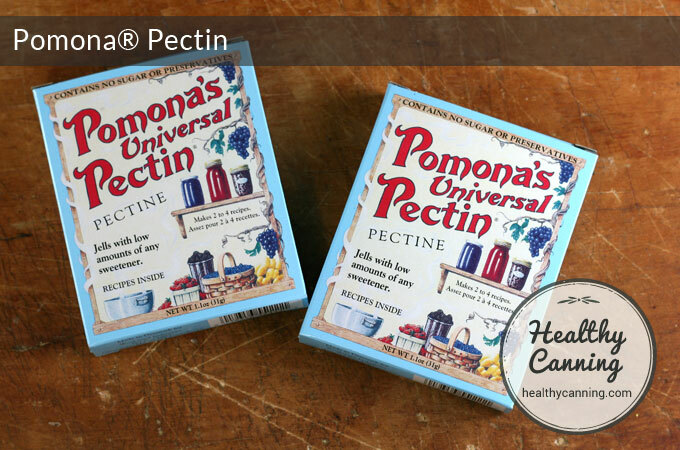 You can buy Pomona’s Pectin now in America, Australia, Canada, New Zealand and the UK. You can order directly from Pomona or one of its distributors, or, get it on Amazon. In Australia, you can order it from Green Living Australia. In New Zealand, you can order it from Lenabosa Farm. 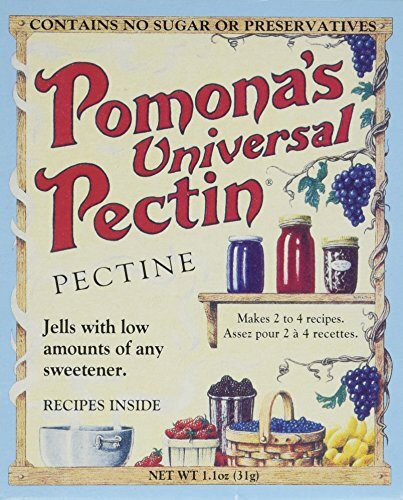 If I didn’t already know how to use Pomona’s Pectin, this would be my go-to article on that information. WOW! You really spent a lot of time putting this post together with all the photos. 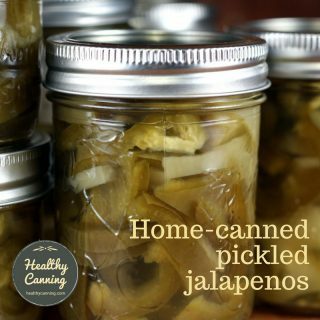 I just want to say, “Thank you!” Happy Canning. I am growing my own stevia plants. 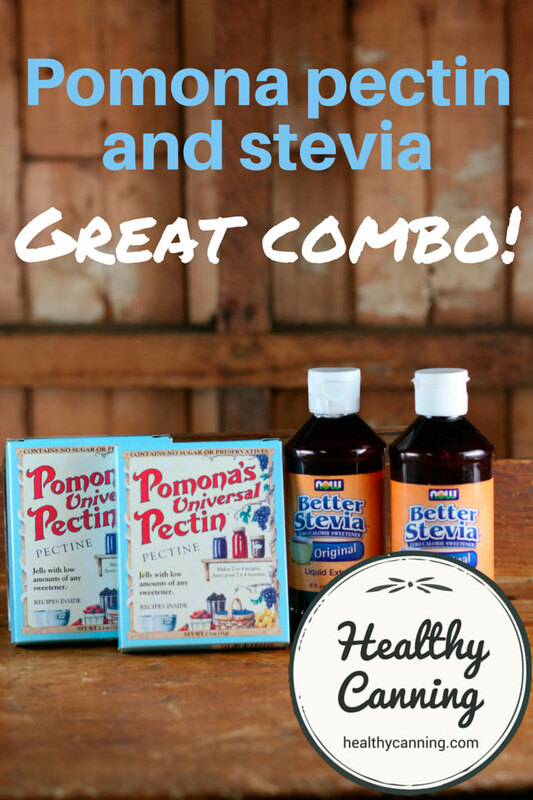 Suggestions on how to use that instead of the stevia you buy in the store. I like it much better. Not as concentrated and no lingering taste when you eat it. Sorry no suggestions on how to prepare it for use from scratch.